Skin cancer is a term that describes a wide range of cancers that originate in the cells of the skin. Skin cancer is the most common cancer in the United States, affecting more than two million Americans each year. While some types of skin cancers occur less frequently than others, almost all skin cancers begin on the top layer of your skin, known as the epidermis. The formation of abnormal skin cells caused by uncontrolled growths is what makes the beginning stage of skin cancer—this is usually the result of excessive ultraviolent (UV) light exposure. When your skin cells are damaged by ultraviolent radiation, the body triggers mutations or defects that cause skin cells to rapidly multiply. The fast multiplicity of skin cells form malignant tumors. Malignant means dangerous and harmful, while benign means not dangerous, i.e. not malignant. These cancerous (malignant) tumors carry cells that will eventually invade our body tissue and develop into what we know today as being skin cancer. Early detection can save your life, so it is important to be fully aware of skin cancer and understand what you can do to avoid the country’s most common type of cancer. So let’s begin! Each layer provides its own benefit towards your body and has a specific duty to help keep your body at the optimal level of health. Which sunscreens are the best? Here is a countdown of the best sunscreens out there. Most of which you can purchase right here in any of our offices! Skin cancer is a general term used to refer to various forms of cancer of the skin. Here we want to inform you about the different types of cancers that fall under the category of “skin cancer,” and go into further detail on what it means for you. We will begin by addressing different types of cancers, everything from the very common to the extremely rare. First up is one of the most commonly known skin cancer types…basal cell carcinoma. 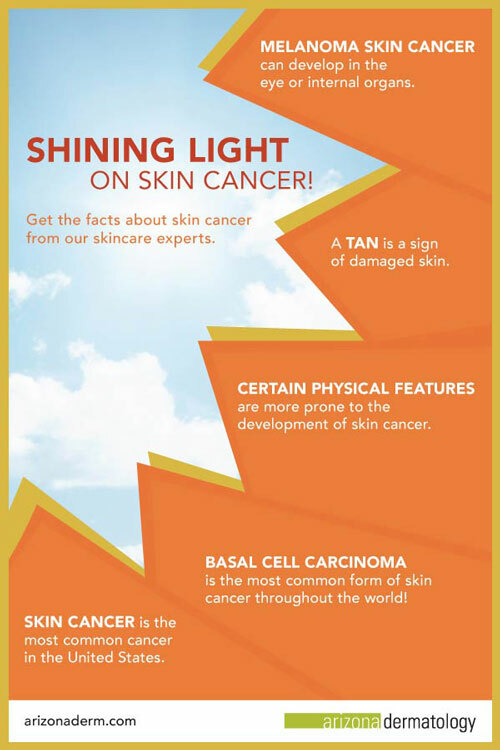 Basal cell carcinoma (BCC) is the most common form of skin cancer throughout the world! As years have passed, the number of BCC cases have continued to rise. This is can be caused by people neglecting to implement proper sun protection routines, ultimately jeopardizing their skin to harmful ultraviolent rays. Basal cells line the deepest layer in the epidermis. BCCs are abnormal growths or lesions that come in many different shapes and sizes. The tumor is commonly compared to a small, round pimple-like growth. In the early stages of BCC, the tumor forms as a pink patch on the skin or an open sore that may heal on its own and return periodically. BCC often occurs on areas of the skin that are most exposed to the sun such as the face, scalp, neck trunk and legs. However, basal cells may appear anywhere on the body and destroy surrounding tissue. According to the American Academy of Dermatology, the following items listed out are factors that can unfortunately help contribute to the development of BCC. Be aware of any new growths or changes that may occur on your skin, and consult with a dermatologist to have them examined and treated if necessary. Squamous cell carcinoma is the second most common type of skin cancer in the United States, affecting 20% of the country’s one million skin cancer diagnoses each year. Like most skin cancer, patients most likely develop SCC from harmful amounts of exposure to the sun’s ultraviolent rays. Prevent SCC and many other skin cancers by performing monthly self-exams and contacting Arizona Dermatology if any new growths or skin changes occur. Find out why tanning beds are a dangerous and bad “solution” to attempting to avoid the effects of intense sunlight from the direct sun. Turns out, tanning beds can be just as bad, if not worse! Melanoma, also known as malignant melanoma and cutaneous melanoma, produces cells known as melanocytes in the skin. Normal melanocytes are located in the outer layer of the skin and generate the pigment melanin that provides you with the colors in your eyes, hair, and skin. However, melanoma occurs when our normal melanocytes become cancerous and continue to grow without controlling them with proper treatment. Eventually, these cancerous cells will damage and replace the surrounding tissue and then progress to spreading throughout the body. Below are a few characteristics that may increase the risk of developing melanoma—they can be used to help identify the earlier stages of skin cancer. Although melanoma is possible to cure if detected early, it can become life-threating to those who allow the cancer to spread. If you notice any changes or growths that may seem unfamiliar, contact Arizona dermatology immediately. Additionally, it is important to note that melanoma skin cancers can appear like “normal” or benign moles, dark spots, or even flatter freckles. By paying close attention to your skin and keeping track of anything new that may appear on your skin, or any changes to existing moles, you can work to prevent skin cancers from forming. Now that we have covered the more common types of skin cancer, let’s take a look at those that occur less frequently. Although these types of skin cancer happen less often, some can be just as serious, potentially leading to severe illness or death. Kaposi’s sarcoma is a type of skin cancer formed from abnormal cells that line the lymph nodes or blood vessels. These dangerous cells then progress to form red, purple or brown growths or tumors on the skin. The areas most affected by this type of cancer are the skin, mouth, and lymph nodes, but Kaposi’s sarcoma can develop and affect other parts of the body as well. Kaposi’s sarcoma is caused by the Human Herpes Virus 8 and may also spread through sexual contact. This type of skin cancer can cause tumors beneath the surface of the skin by forming tiny new blood vessels. The visible signs of kaposi’s sarcoma are lesions that appear red to purple, flat, and painless. Kaposi’s sarcoma is not considered life threating. Kaposi’s sarcoma is most often seen in HIV infected patients. Merkel cells are in the top layer of the skin, surrounding our nerve endings that provide us with the sensation of touch. Merkel cell carcinoma, also called neuroendocrine carcinoma of the skin, is a rare type of skin cancer in which our merkel cells grow uncontrollably and quickly spread to other areas of the body during the early stages of development. This uncommon skin cancer forms flesh-colored or bluish-red nodules that appear firm and painless when touched. Fair-skin individuals over the age of 50 who often receive sun exposure are at a greater risk to develop merkel cell carcinoma. This aggressive cancer can be difficult to cure after spreading throughout the body, which makes this type of skin cancer extremely dangerous. A sebaceous gland is a small gland that distributes sebum (lubricating oil) into our hair follicles. Our body produces this oily substance to lubricate the skin and hair, and keep our skin water resistant. We all have sebaceous glands all over our body, besides the palm of our hands and the soles of our feet. Sebaceous gland carcinoma is a rare type of skin cancer that typically forms a growth on the eyelid and the area around the eyes. However, it has been seen to form on areas most effected by sun exposure like most other skin cancers. We have the greatest number of sebaceous glands in and around the eyes which makes this area most susceptible to sebaceous gland carcinoma. This hostile cancer can quickly spread, making it deadly if allowed to grow without treatment. Dermatofibrosarcoma Protuberans (DFSP) is a tumor deep within the skin and is categorized as a soft tissue sarcoma. Soft tissue sarcoma includes a range of cancers that affect the skin, fat, and muscles. When the tumor begins to form, it first appears as a flat patch, which slowly grows in size and may appear purplish, reddish, or flesh colored. Eventually, the tumor may become a raised nodule and can be commonly found on the torso. The tumor has a tendency to return after removal, but does not spread to other parts of the body like many other dangerous skin cancers. . People usually first show signs of DFSP during their thirties, but could have initially developed the cancer far before seeing any visual symptoms. Read just how often you should see your dermatologist to make sure you’re going as often as needed! You might be overdue for your next appointment and not even know it. Early detection is the best solution to avoid the major complications that come along with skin cancer and can ultimately save your life! In order to detect skin cancer at its earliest stages, it would help if you knew what you were looking for. Take a look at some of the warning signs of skin cancer and remember to perform monthly self-exams for early detection. These are abnormal benign moles that may resemble melanoma. They look larger than a common mole and have an irregular shape with uneven color. A normal person has between 10- 40 moles throughout adulthood. Moles should never bleed, itch, or hurt. If you notice a change in color, height, size, or shape, especially after the age of 30, it is recommended to contact a dermatologist and have the growth evaluated. This is a small, rough patch that may appear raised on areas of skin most vulnerable to sun exposure. These are very common and are considered a precursor to squamous cell carcinoma (SCC). This sign forms a whitish discoloration on the lip and around the border connecting the lip and skin. As actinic cheililtis progresses, it can become swollen and form scaly patches to the lip. The cases of skin cancer continue to rise and affect millions of people annually throughout the United States. It is the most common of all cancers, accounting for nearly half of all cancer cases in the country. By taking the necessary steps to apply sunscreen, wear sun protective clothing and avoid long amounts of intense sunlight, you can add years to your skin, making you look and feel healthier! Don’t stop at simply protecting your skin slow down the signs of aging. Take a look at a few ways you can look younger, just by taking a short trip to one of our offices! The professionals at Arizona Dermatology have the expertise and experience needed to help with all of your skin care needs, as well as answer any questions you might have. Don’t ignore the signs of skin cancer and hope it will eventually go away. Give Arizona Dermatology a call and let us help ease your mind by providing you with the proper evaluation, skin cancer screening, diagnosis and treatment. Take care of your skin and it will take care of you!